How is a military divorce different from a civilian divorce? When filing for divorce from a military spouse or if you are the spouse serving in the military, it’s important to know that special rules apply to military service members, especially those on active duty. In a military divorce, the courts are sensitive to the fact that an active duty spouse may not be able to participate in the divorce according to the same timeline that is followed in a civilian divorce. The Servicemembers Civil Relief Act allows a court to delay or stay the proceedings until he or she is available and offers other provisions. It can also be difficult to know where to file for divorce given that military families frequently move. There may be questions about child custody. The child may need to be cared for almost exclusively by one parent while the military parent is on active duty. 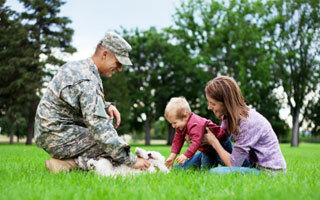 How can kids keep in touch with their military parent and how can custody change after the parent returns home? There are also issues surrounding military pensions and how they are divided in divorce. The rules are different from other civilian retirement accounts. There are other matters in divorce that are also specific in military families, including questions about military health insurance and base housing. Bari Zell Weinberger is the owner and managing partner of Weinberger Divorce & Family Law Group in New Jersey. She is certified by the Supreme Court of New Jersey as a Matrimonial Law Attorney. How does a military divorce differ from a civilian divorce?